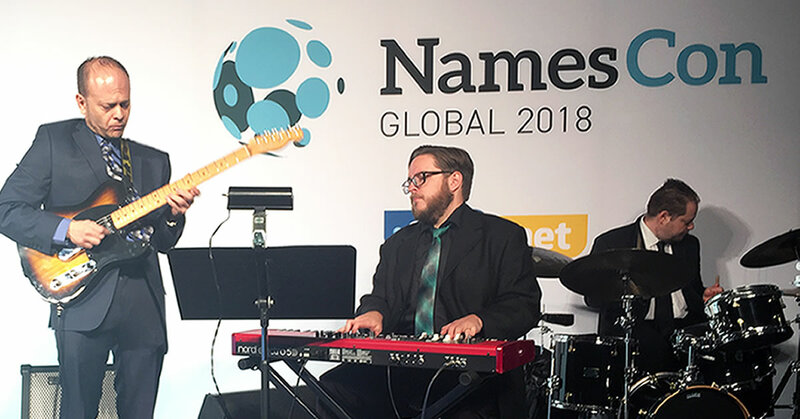 On Saturday January 27th I boarded a plane from Pearson International in Toronto, Ontario, Canada and headed to my first experience with the domain name industry, an event called NamesCon 2018 at the Tropicana Hotel in Las Vegas, Nevada, USA. I was on a mission to represent Joomla to the attendees of this event, to find new sponsors for the project, and to keep in touch with others that I met last fall at World Hosting Days which was at the very same location. You knew domain name buying and selling was a thing but maybe you didn't realize how big it is. I remember years ago when friends of mine were buying domain names in the hope of making money none of them ever reported back about making a profit selling them. All those domains they bought needed to be renewed each year. If one had a lot of domain names in their portfolio it was a fairly hefty investment that may or may not pay off. I didn't get into it myself. Back then I figured some people might get lucky and bag a few clever domain names to sell to someone who was willing to pay big bucks for later. Surely this couldn't be a great path to riches. Boy was I wrong. It's big, probably bigger than you imagined unless you are already in the business. 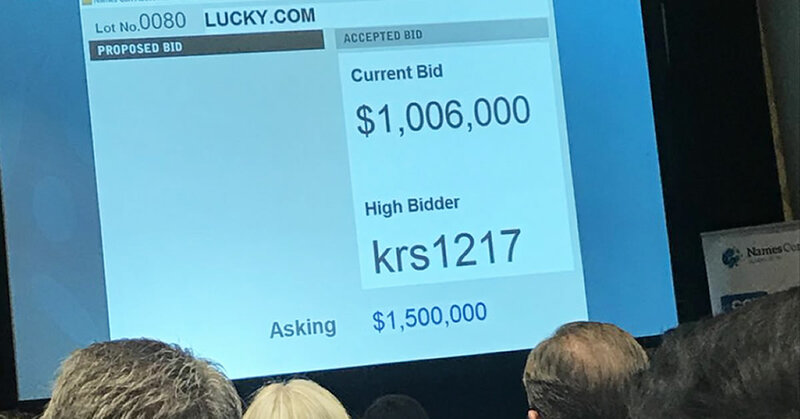 At the NamesCon 2018 auction the auctioneer was hollering out bid amounts for some domains in the hundreds of thousands of dollars, including a few for a million plus. Later when I Googled what some historic high prices for domains have been I found things like "Insurance.com" sold for $35.6 million in 2010, "VacationRentals.com" sold for $35 million in 2007 and "PrivateJet.com" sold for $30.1 million in 2012. The articles that published those prices said that there may have been other items included along with the domain name asset. Still, it gives you an idea about the domain industry. Later in the evening after the NamesCon 2018 auction there was a lively social event with a lot of celebrating going on. Happy buyers wearing huge smiles abounded in the very loud and over amplified party I was at. There's lots of money in this industry. All the attendees at NamesCon 2018 were really nice people. Being a newbie at this sort of thing I was very grateful for the information that was freely shared by experienced "domainers" as they call themselves. Techniques on how to package domains for sale was explained, things like creating artwork and websites to highlight a domain name with the purpose of enticing potential buyers and showing them how a name can appear to an online audience. I was sent to NamesCon 2018 to represent Joomla.org to the attendees and exhibitors. There's a crossover of people who come to domain events that also attend web hosting shows. I met several people at this event who were in the same place last fall when I attended World Hosting Days. A rapport is now growing between myself and some of the familiar faces. Several people genuinely expressed how happy they were to see someone from Joomla there. I'm currently the Capital Team Chair for the Joomla project. Our team is the one that brings sponsorship and advertising money into the project so Joomla.org can run its operations. Joomla is an open source software project run by volunteers but there are expenses associated with it. Things like the maintenance & operation of domains, Joomla's presence at IT events, expenses for code sprints, funds needed to run JoomlaDays and other Joomla events as well as other associated services. The project also has to pay taxes, accounting, and legal expenses. Legal expenses are for things like protecting the Joomla trademark. Is it worthwhile for Joomla to be at an event like this? It is very worthwhile for the Joomla project to have visibility at an event like NamesCon. Some of the meetings that I had, a few of which also included other leaders from the Joomla project such as Robert Jacobi, President, and Mike Demo, Treasurer, will certainly bear good fruit and bring in a nice return on Joomla's investment for attending this kind of event. We're currently in ongoing negotiations and planning with a couple of key companies for high level Joomla sponsorship and partnership arrangements. It's very exciting. The other thing that occurred at this event was the opportunity to clarify what Joomla is all about. Several companies attending this show were surprised to hear that I was a volunteer for the project and not employed full time. Joomla is unique in this way, there is no paid staff at Joomla.org or Open Source Matters. Everyone in leadership or who participates is a volunteer. 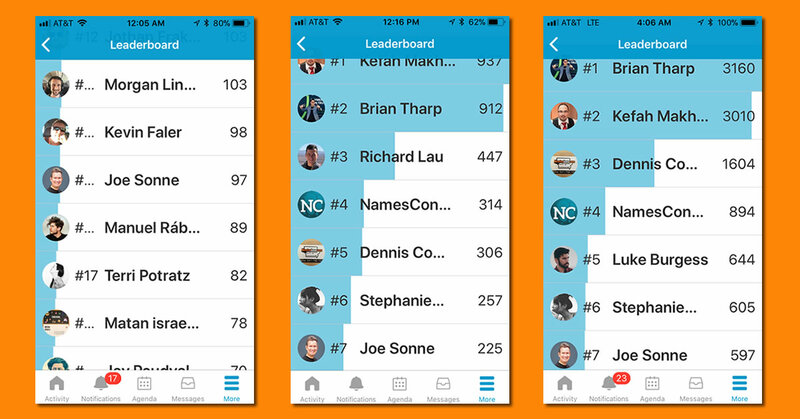 I personally haven't been to many of these kinds of events so I was a surprised when Mike Demo mentioned that I was showing up on the 'Leaderboard' of the NamesCon 2018 app. The app was available for anyone registered at the event that wanted to connect and communicate with other attendees and exhibitors through their mobile devices. The idea is that you can Tweet your activities to all the NamesCon people, send private messages back and forth and request meetings too. The app had some deficiencies, many of us couldn't get the meeting requests to work, but the private messaging and activity stream worked great. So there I was Tweeting what was going on from my perspective about the event and Mike showed me the 'Leaderboard' list. I was way down on the list but high enough to appear. NamesCon was running a Leaderboard contest. At the end of the event they would draw a name from the top 10 users on the leaderboard for a free ticket to the next NamesCon. You can see from the picture below how my score on the Leaderboard climbed. I only managed to get as high as number 6 and settled at a final position of number 7 at the end of the event. I have no idea how the top person managed to get as high a score as he did because I was working this app pretty hard and didn't even come close to his score. He must have had an associate working the app full time during the event to rack up those kinds of points. I qualified for the draw but didn't win, however, Joomla got a lot of attention with the leaderboard. the domain industry is thriving and lively. The people are fun. The sessions I attended were fantastic. The NamesCon event in general was run excellently. What's not to like? It's an investment in time and money to be at an event like this but If you want to get serious about the domain industry I can't think of a better place to go. The level of knowledge that is being shared is tremendous and the networking is excellent. I was really hoping to win that free ticket for the next NamesCon. That was my only disappointment.